Presidential candidate Mitt Romney has visited an emergency centre in hurricane-damaged Louisiana, a day after accepting the Republican nomination for US president. Mitt Romney attended a Friday rally with running mate Paul Ryan in Florida before cancelling a campaign stop in Virginia and diverting to the South. Hurricane Isaac caused heavy flooding in areas around New Orleans and damage across the Gulf Coast. The Democratic president is due to tour storm-affected areas of Louisiana Monday, a US national holiday. At least six deaths in Louisiana and Mississippi have been attributed to Isaac, which brought up to 16 in (41 cm) of rain in some areas. Mitt Romney travelled on his new campaign plane to Louisiana, at the invitation of the state’s Republican Governor Bobby Jindal. The two spent almost an hour meeting local officials and first responders on Friday. The presidential candidate shook hands with National Guardsman and met residents who had lost their homes in the storm. “He just told me to, um, there’s assistance out there,” resident Jodie Chiarello said. Former Republican President George W Bush’s response to Hurricane Katrina, in which 1,800 people died seven years ago, was widely perceived as a failure. This year, Hurricane Isaac wrought less destruction and New Orleans benefited from a revamped set of flood defences erected after Katrina. 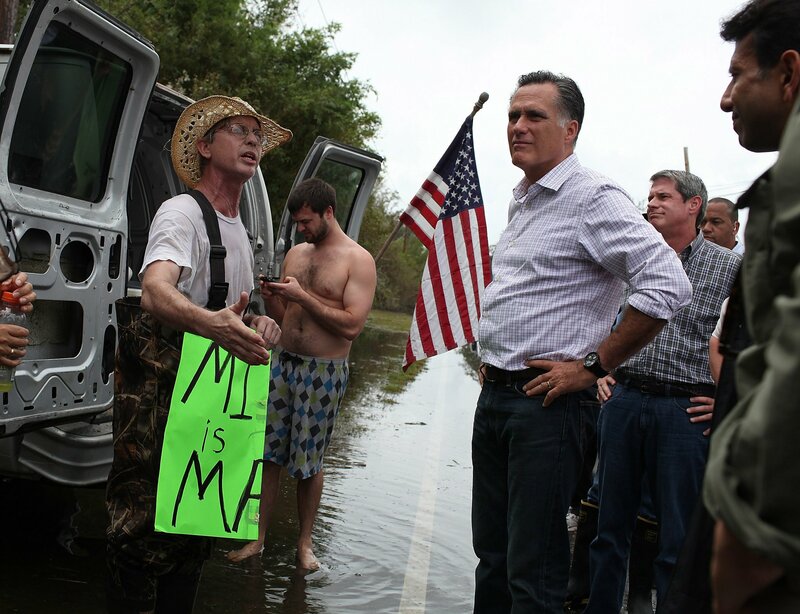 Correspondents say both Barack Obama and Mitt Romney were eager to display crisis leadership in the wake of Isaac. “The decision to travel on Monday was made before Governor Romney announced his decision to travel to Louisiana on Friday,” an Obama aide told reporters from the presidential plane Air Force One. Meanwhile, the Romney campaign insisted it had not hurried to appear first amid the storm wreckage. Barack Obama made federal emergency aid available earlier in the week. But he pledged further assistance for individuals in a Friday call with parish presidents and local leaders in Louisiana and Mississippi. Senate Majority Leader Democrat Harry Reid said Mitt Romney’s visit was the “height of hypocrisy”, adding that Republicans planned to gut disaster aid. Plaquemines Parish, just outside New Orleans, was among the areas hardest hit by flooding after an 8-ft (2.5-m) levee was overtopped, leaving many homes under about 12ft of water. The Plaquemines levee was not part of a multi-billion dollar upgrade to the federal levees protecting the city. Among those killed in the US by the storm were a man and a woman in the town of Braithwaite who apparently drowned in their kitchen as flood waters surged in. In Mississippi, officials have been pumping water from a reservoir on the Louisiana border to ease the pressure behind a storm-battered dam. About 600,000 people across Louisiana, Mississippi and Arkansas are without power as of Friday, Reuters reports. Mitt Romney capped off the Republican convention on Thursday evening with a speech accusing President Barack Obama of failure. The Obama campaign said the Republican had “gauzy platitudes, but no tangible ideas to move the country forward”.